Top: BLM Science Coordinator Louisa Evers presents "Understanding Climate Adaptation Strategies". Bottom: Rangeland Ecologist Brady Allred presents "New technology and frontiers: Efficiently measuring conservation outcomes with Google Earth Engine". View free, on-demand replays of 20-minute educational presentations about the science and management of sagebrush rangelands! 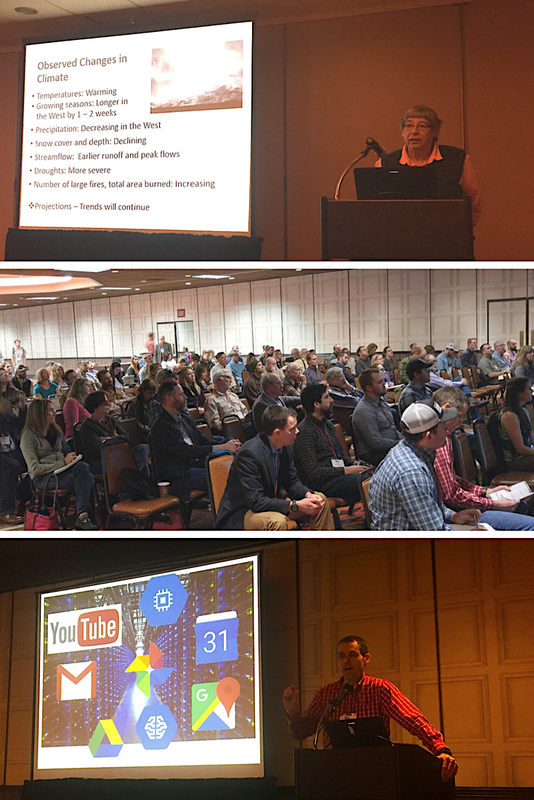 Two special symposia hosted at this year’s annual meeting of the Society for Range Management in Sparks, Nevada, featured three-dozen presentations by researchers and land managers sharing cutting-edge science and management in sagebrush country. In addition to packed in-person audiences, the sessions were also live-broadcast online, reaching hundreds of viewers across the country. Each of the thirty 20-minute long presentations were recorded—in case you missed the live symposia, or just want to refresh your memory on a particular topic, you can now watch on-demand replays. The broadcast and recordings were made possible by a collaboration between the Society for Range Management, Bureau of Land Management, Natural Resources Conservation Service-Sage Grouse Initiative, Intermountain West Joint Venture, and Utah State University. If you are interested in future broadcasts and other similar communications, please sign up to receive a monthly newsletter produced by www.PartnersInTheSage.com and the Intermountain West Joint Venture.